Spring 2019 Textbooks available now! The Summer 2019 Book List is available now! 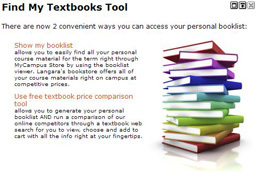 Log in to your MyLangara account, go to 'MyCourses', and click on the "Find My Textbooks Tool"
Shop online and use our pick-up or delivery service, or come into the Bookstore to purchase your textbooks. Keep it on Campus - Surplus revenue generated from sales goes back into funding the college, which means that when you buy at the Bookstore your dollars support and enhance student services and programs. At your on-campus store, you will find a full range of school supplies, official Langara logo spirit gear, as well as all of your textbooks and course materials. Shop online, compare prices, and use our pick-up or delivery service to avoid long line-ups. You can also purchase convenience products including computer accessories, stationery, drinks and snacks. 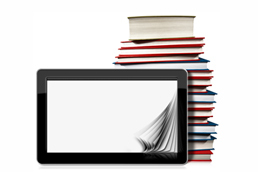 Purchase your digital e-Books online - no need to carry heavy books. Use the "Find My Textbooks Tool" to access your personal booklist for classes. You will be prompted to login to myLangara. Learn more about Langara's Bookstore. Purchase a Bursary Bag for $1.00 in the Bookstore to support Langara Bursaries.